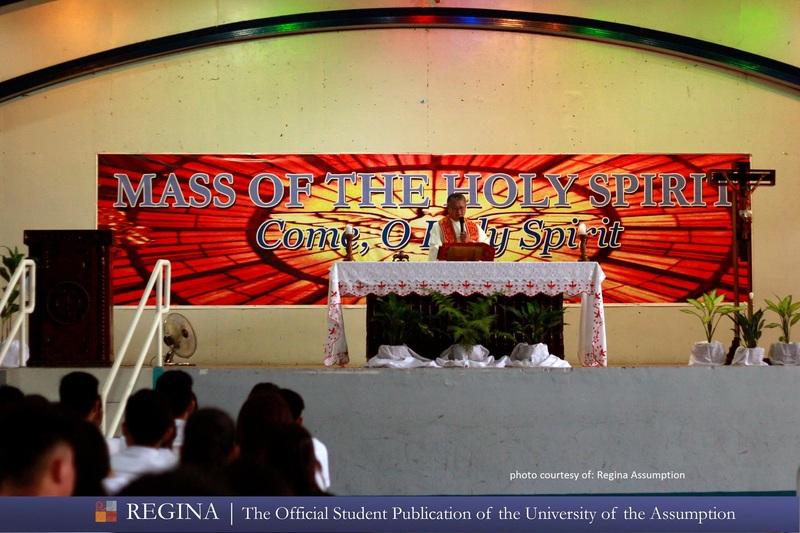 To mark the beginning of another school year, the University of the Assumption (UA) held the Mass of the Holy Spirit at the Msgr. Emilio Cinense gymnasium on June 22, 2018. It was attended by students, faculty, administrators, staff and other members of the UA community. The University President Rev. Fr. Joselito Henson and Fr. Israel Garcia were the Mass celebrants. He closed his homily by challenging the UA community to ensure that “tame the holy spirit’ in everyone so that it stays and bear fruit. “We pride ourselves in being a Catholic University. As a catholic university, we should all be experts in domesticating or taming the Holy Spirit and in reaping its fruits. It will indeed be a shame if UA becomes a place of division, of irresponsibility and apathy – because if that happens, the first to fly off and leave is the Holy Spirit,” Henson said. The Mass of the Holy Spirit is celebrated by the UA community annually to implore God’s guidance for an excellent and progressive academic year.